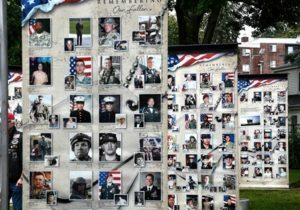 Photographs of military veterans who died since 9/11 displayed at Union Common in Marlborough. Marlborough – An opening ceremony took place Aug. 22 at Union Common in Marlborough to mark the first of a four-day display known as “Remembering Our Fallen”. 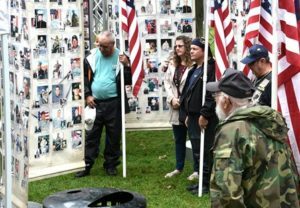 The national touring photographic memorial, which will be displayed until 6 p.m. on Saturday, Aug. 25, honors military veterans who died since the War on Terror began after the September 11, 2001, terrorist attacks against the United States. Boston Scientific sponsored the exhibit in Marlborough, which is the tour’s first stop in New England. 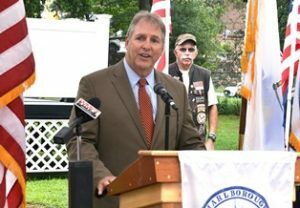 Mayor Arthur Vigeant welcomed guests including Gold Star families, the Patriotic Guard Riders, Veterans Services Officer Nicholas Charbonneau, state Rep. Danielle Gregoire (D-Marlborough) and several city councilors. 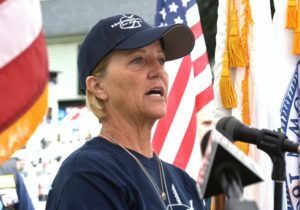 Wendy Carruthers, senior vice president of human resources with the event sponsor Boston Scientific, expressed her pride that hundreds of its employees advocate for veterans causes. 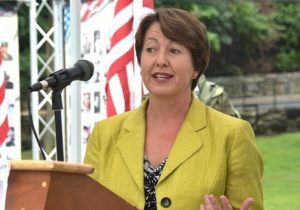 Noala Fritz of Verdon, Neb., tours with the memorial and speaks at ceremonies on behalf of Gold Star families. Her son, Army 1st Lt. Jacob Fritz, is represented with photos in the exhibit. A graduate of the U.S. Military Academy at West Point, he was killed in 2007 at age 25 in an attack on an Iraqi security facility in Karbala. The exhibit features 31 towers with photographs of over 5,000 veterans. Families were asked to provide two photos of the fallen veterans: one wearing a military uniform and another more casual. Among the veterans remembered on the towers are those who were killed in training and others who committed suicide as a result of post-traumatic stress disorder (PTSD). Joyce and Kevin Lucey travelled to Marlborough for the ceremony from their home in Belchertown. Their son, Marine Cpl. Jeffrey M. Lucey, is pictured in the exhibit wearing his uniform alongside a collage of him as a youngster. 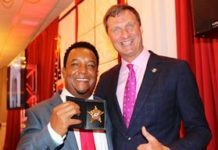 He enlisted as a Marine Reservist in 1999 at age 18 and served in Iraq in 2003. Upon returning home, his parents sought help from the Veterans Administration when he exhibited symptoms of PTSD. In 2004, he hanged himself at age 23 in the basement of his parents’ home. For more information about “Remembering Our Fallen,” visit RememberingOurFallen.org and facebook.com/RememberingOurFallen. Mayor Arthur Vigeant welcomes guests to the opening ceremony. 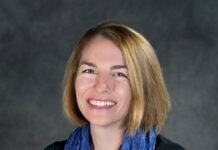 Wendy Carruthers speaks on behalf of event sponsor Boston Scientific. Gold Star mother Noala Fritz chronicles the pictorial exhibit’s history. Members of Patriotic Guard Riders listen to opening ceremony speakers. Marine Cpl. 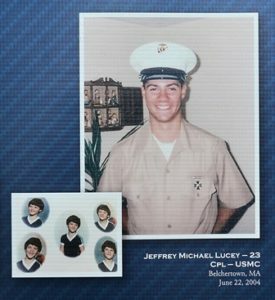 Jeffrey M. Lucey is pictured in the “Remembering Our Fallen” exhibit.